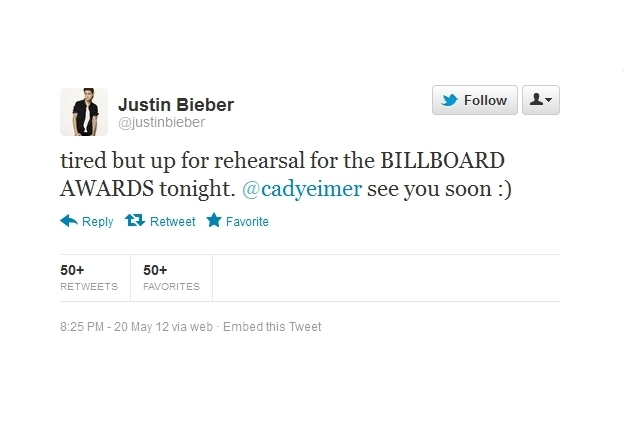 Justin Bieber Took Lucky Fan to 2012 Billboard Music Awards. Justin Bieber proved he's got nothing but love for his fans after he invited a female fan to join him at the 2012 Billboard Music Awards after having to decline her invite to attend her prom. Find out more details, next! It seems that being a devoted fan definitely pays off as a high school student proved recently after being invited by none other than Justin Bieber to the 2012 Billboard Music Awards. The super lucky fan was 18 year old Cady Eimer, who apparently asked the 'Boyfriend' superstar to be her date for the prom, via her website, but because Justin had a prior obligation to attend the Billboard Music Awards, he decided to surprise the young teen by asking her to join him at the popular event instead. The big announcement was made during prom night through a funny video message in which Justin personally announced the enthusiastic 'Biebette' that although he couldn't attend the prom he has made arrangements for her and her sister to join him in Las Vegas, for the awards show. The online celebrity invite craze started when actress Mila Kunis was invited by a marine sergeant to join him at the Marine Corps Ball and it seems that celebrities were not shy to respond to some of the invites. He also took it to his Twitter account to reassure his 'date' to the Billboard Music Awards that the countdown has started. Justin wrote to his fans that he's 'tired but up for rehearsal for the BILLBOARD AWARDS tonight. @cadyeimer see you soon :)'. Although he didn't get Cady a corsage, Justin made sure the girls had reserved seats right behind him and the ladies looked super excited. It's not every day that you're presented with the opportunity to join your favorite celebrity at such an important event, plus have that celebrity pay for all expenses, so no wonder that the sisters were glowing of excitement. Check out Justin Bieber's invite video, and tell us what you think!